A combination of the best illumination and calligraphy from two books made for collectors. I realized that I needed at a demonstration model of some of my more recent 15th c. style work that was larger than 3 inches. Fortunately I had some clients hire me to do some books that were about the same size, so I decided to combine them under one cover. This book has 76 pages, not including the two end leaves that are pasted down to the inside covers. The book is bound into quarter sawn oak boards that were beveled in sections on the outer faces. I originally planned to make corner bosses with folding down edges, but my priority was to finish in time for the Virginia Festival of the Book, and I just did not have the time. Then I realized that the book actually looks great without them. I may add them, but the brass would clash with the bronze on the clasp. The clasp is based on a Romanesque type. A strap with hardware reminiscent of a comet is anchored in a recess on the back cover. 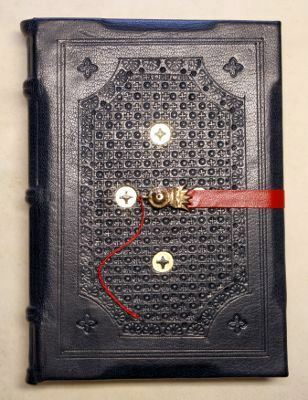 The strap itself is very thin red leather wrapped around a piece of parchment to resist stretching. It terminates in the comet head, a tab that slides down over a pin that protrudes from the center of the front cover. Even the pin is mounted in a flower disk. 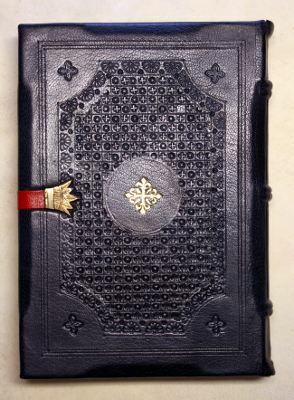 The dark blue goat leather cover is richly stamped in a gothic diaper pattern. There are small accents of genuine gold leaf gilding on the front and back.